There has never been a dish I have made that has quite the intriguing history that Persian Kabob Koobideh does. The story goes: during medieval times, Persian warriors used their swords to roast meat over an open fire. The sword would heat up, cooking the meat evenly from both the outside and the inside. This technique resulted in a cultural tradition of roasting meat on skewers that was passed down through the ages and shared across the world by many cultures. 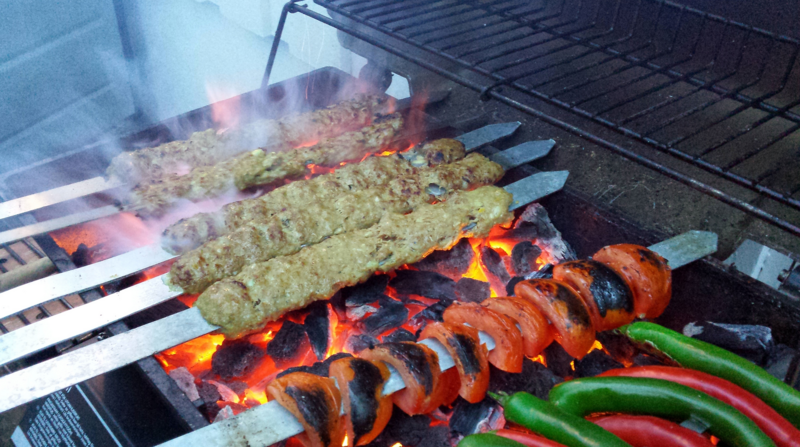 In Iran, Kabob Koobideh (beef kabobs) is one of the most popular signature dishes in their culture. Often, it is prepared from a mix of lamb and beef combined with onions and spices that give the kabob it’s distinct flavor. However, like most recipes, over the years, each family has developed their own version of this timeless classic by choosing the meats, spices, and herbs they like best in their koobideh.I have a life-long Persian friend named Ameneh, who is more like a sister to me than a friend. Ameneh recently taught me to make her version of Kabob Koobideh. Since I first tasted Ameneh’s koobideh, it has been one of my favorite Persian cuisines. It’s also one of the more straightforward recipes to make. Since traditional Persian methods carefully prepare each meal with fresh cut vegetables, herbs, spices, and meats, many times the recipes can be time-consuming to prepare and to cook. That’s not the case with Kabob Koobideh. Once your rice and salad are made (which you should prepare ahead of time), you can have an authentic Persian dinner on your table in less than 30 minutes. Since I live in Minnesota, grilling outside in below zero temperatures doesn’t exactly entice me to fire up the grill. So, during the colder months, I use an indoor countertop grill. It works like a charm, and the results are tender, delicious kabobs every time. My favorite way to enjoy Kabob Koobideh is with Basmati rice with potato tahdig, Maast O Kiar yogurt dish, Torshi, Lavash bread, and Salad Shirazi. A traditional beverage served with Iranian Kababs is yogurt drink called Doogh. Sprinkle a bit of with dried mint or rose petals on top for a refreshing sip between bites. 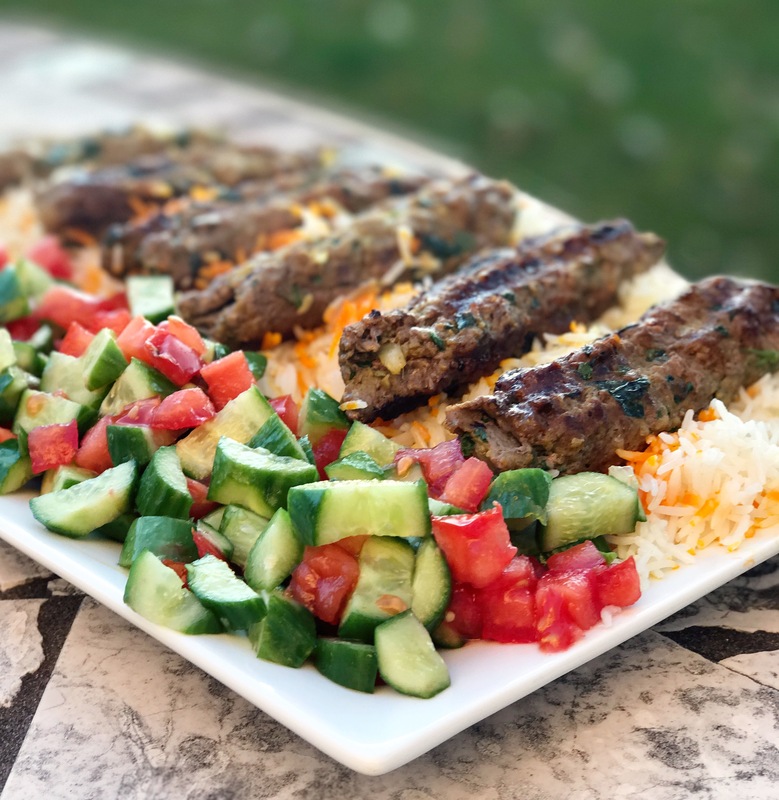 There is no one way to enjoy Kabob Koobideh so however you choose to eat it, this may become one of your favorite Persian recipes too. 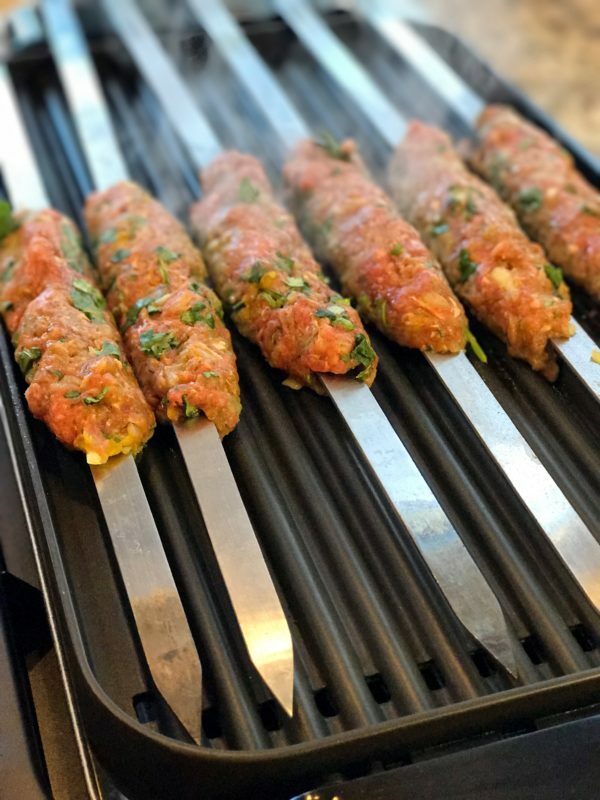 Koobideh is delicious Persian beef kabob made with spices and grilled to perfection in under 10 minutes. Serve with rice and yogurt salad for the perfect Persian meal. 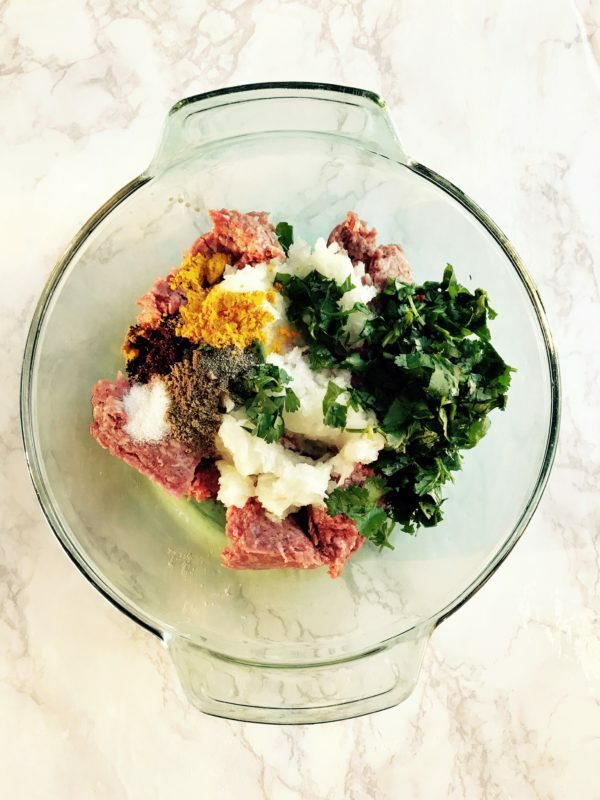 In a large bowl, add ground beef, onions, cilantro, salt, sumac, coriander seeds, turmeric, and black pepper. Using your hands, mix spices and herbs into meat until well combined. Using a fist-size portion of meat, wrap the meat around a metal kabob skewer and spread it out approximately 5-6-inches long. Set aside until all skewers are complete. If you don't have metal skewers, use the handle of a wooden spoon to create a hole in the center of the meat. (This helps to cook the meat evenly.) Gently pull the meat off of the handle and repeat until all meat is used. If using an outdoor grill or countertop grill, make sure it is very hot (approx. 300°) before adding the kabobs. Lay kabobs in a single row. Grill 4-5 minutes or until it is nicely browned, turn kabobs over and continue to grill an additional 4-5 minutes or until kabob meat cooked through. Remove from heat and serve with grilled tomato, basmati rice, Maast-O Khiar, and Torshi for a beautiful Persian meal. Using ground beef with 80/20 fat content creates a juicer kabob because of the higher fat content. 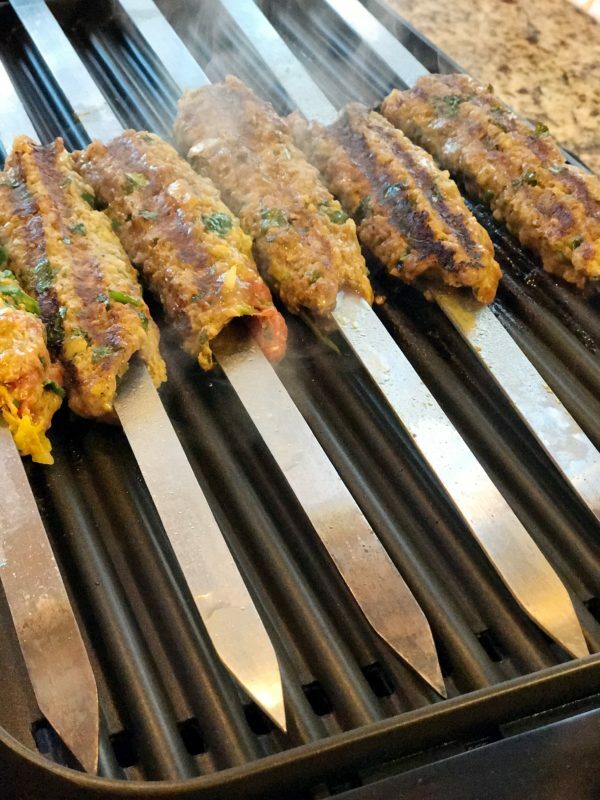 Many Persian Kabob recipes use a combination of beef and lamb for those who like the taste of lamb. I’m so glad you like the Koobideh recipe! It is one of my favorites as well. I see you are also making the basmati rice with tahdig for a complete Persian meal. I love it! Persian food is often made with fresh herbs and spices, so it’s tends to be quite healthy and of course delicious! Thanks for sharing your comment. I just love hearing about recipe successes! Looks and sounds delicious! I want to try to make it but I think it will be a challenge to find ground lamb here. Wait, Easter is coming, there’ll be some in our markets! 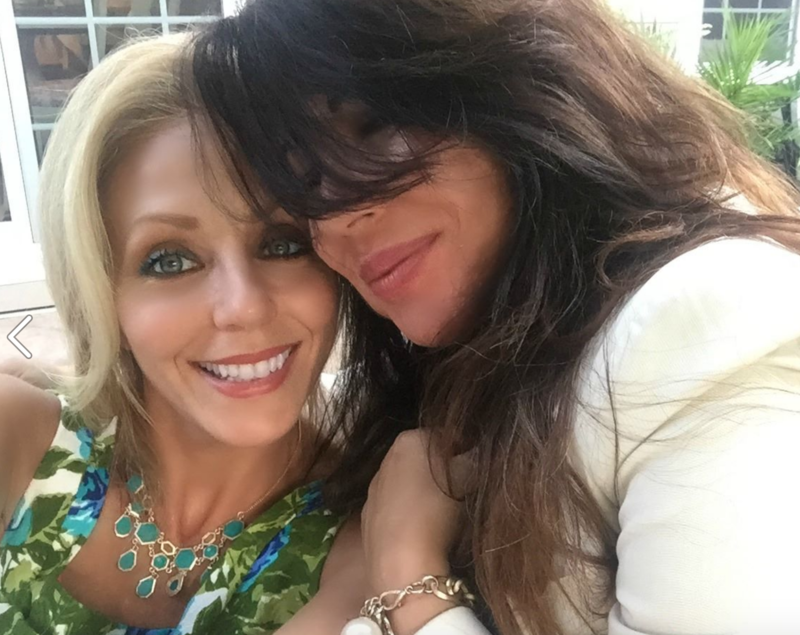 Loved the review Donna gave, give me confidence in myself! Thank you all for sharing!